” IMP uses the marathon as a vehicle to promote healthy lifestyles to Aboriginal and Torres Strait Islander peoples. Running is accessible to any age, ability and location and has the tremendous power to instil a sense of personal accomplishment when one has pushed beyond what they thought possible. 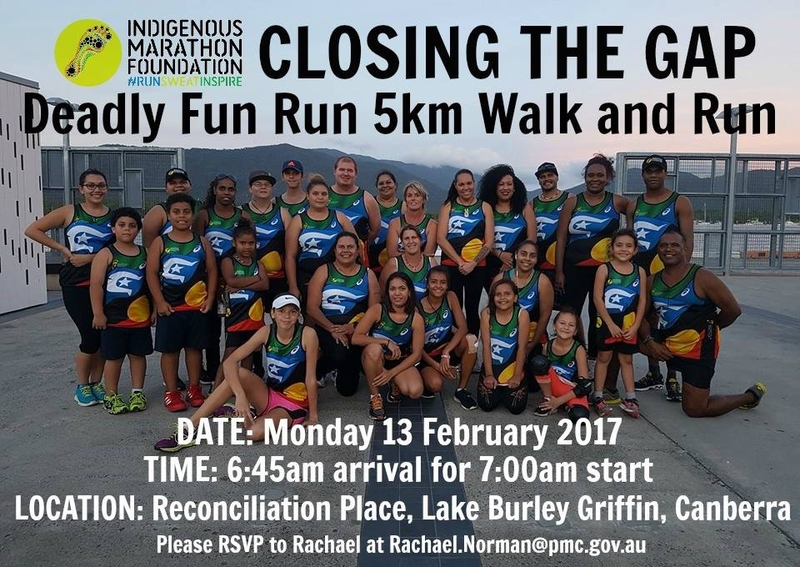 To participate in their Closing the Gap Run-and-Walk, held on the eve of the release of the Prime Minister’s 2017 Closing the Gap Report. The IMF are a not-for-profit organisation that uses running to drive social change, create young leaders and address Indigenous health and social issues by celebrating Indigenous resilience and achievement. Their program has inspired communities across Australia to take up running not just for exercise, but also to connect and share stories in a supportive environment. Healthy lifestyle programs like those run by the IMF are a vital part of the Australian Government’s initiative to close the substantial gap in health, education and employment outcomes between Indigenous and other Australians. Please come to join runners from the IMF and staff from the Department’s IAG Health Branch for a 5 kilometre run-and-walk to support the successful impact sport and recreation programs have in Indigenous communities and kick start the launch of the 2017 Closing the Gap Report. Please bring a water bottle or something to drink on the way. A light breakfast will be available after the run and a coffee van will also be present at the site. The search for the 2017 squad of the Indigenous Marathon Project began in Canberra on February 1 when former world champion runner and IMP Founder Rob de Castella, and 2014 IMP Graduate and Head Coach Adrian Dodson-Shaw put applicants through their paces for a place on the life-changing project. No running experience is required, as the project is not necessarily looking for athletes, but for young Indigenous men and women who show the potential to become community leaders. The national tour will visit communities around Australia and select six men and six women in a trial that includes a 3km run for women and 5km run for men, in addition to an interview with Mr Dodson-Shaw. The group will also be expected to complete a Certificate III in Fitness, First Aid & CPR qualification and Level 1 Recreational Running coaching accreditation as part of the project’s compulsory education component. There were a record number of applications in 2016, and high numbers are anticipated for the 2017 try-outs. “There’ll be some pretty exciting times ahead as we begin the national IMP 2017 try-out tour, and what better place to start than the nation’s capital,’’ Mr Dodson-Shaw said. Mr de Castella said the selection of a new squad is always an exciting time. ‘’The marathon is synonymous with struggle and achievement and it is one of the hardest things you can choose to do,’’ he said. ‘’Doing a full marathon from no running experience, on the other side of the world, in the biggest city in the world, in the biggest marathon in the world, is an incredible feat of hard work and determination. ‘’We are now recruiting a new squad to follow in the footsteps of the 65 IMP Graduates we have produced since 2010. Try-outs are open to all Indigenous men and women aged 18-30, and applications can be made on the day. The IMP is a program of the Indigenous Marathon Foundation, a not‐for‐profit Foundation established by Rob de Castella. Each year IMP selects a squad of 12 young Indigenous men and women, to train for the New York City Marathon in November, complete a compulsory education component – a Certificate III in Fitness, media training and coaching accreditation – and through their achievements celebrate Indigenous resilience and success. The IMP relies on the generous support of the Australian Government Department of Health, Department of PM&C, Department of Regional Australia, local Government, Arts and Sport, Qantas, ASICS, Accor and the Australian public.